We meet Deepa from currystrumpet at Holly Beckers inspiring BYW-class. Deepa is a Manila girl living in Amsterdam and she blogs about her life in the Netherlands and her travels. Deepa loves to brunch as much as we do, so the toppic of our guest post was easy to find. Read the whole post here. I´m bored of the typical cheesy souvenirs. What can I buy that I´ll still like at home? If your home isn´t too far away, buy a box of delicious Luxenburgerli at Sprüngli. A wallet or bag from Freitag is also a nice souvenir, even the truck-made goods are now available outside of Switzerland. 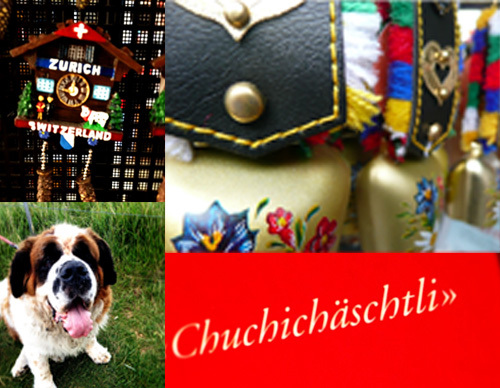 If you speak German, the “Zurich Slängikon” might be a fun start to try understanding the locals. Summer in Zurich wouldn’t be summer in Zurich without the concert series Stadtsommer. Sponsored and organised by the city of Zurich, seven local bands get to choose a location to play for one night. For all those not lying at the beach somewhere in the south, Stadtsommer is the place to listen to good music, mingle and enjoy a Zurich summer night. Free entrance. myfriendfromzurich is especially looking forward to Fiona Daniel (July 28) and to the comeback of Baby Jail (August 1th). Have a look at the line up here. Where can I park my car in Zurich without spending a fortune? Parking in Zurich? Are you sure you don’t want to ride your bike or take the bus? Be warned: Parking in Zurich is an expensive thing, be prepared to spend at least 20 bucks a day in a regular car park. Or you can go hunting for the so called „blue zone parking lots“, where you can leave your wheels for a limited time for free. Don’t forget the parking disc though! If you already know that you need to park for a longer time, it’s best to get a daily parking permit for the blue zone. It costs 15 francs a day and here you’ll find out more about it.